Italy centre Gonzalo Canale made his international debut against Scotland in 2003. 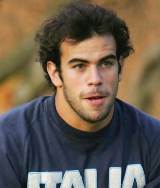 Born in Cordoba, Argentina, Canale has become one of the most important backs in the Italian setup. Currently playing his club rugby for Clermont Auvergne in the French Top 14, Canale moved to Italy aged 18 after turning out for La Tablada of Cordoba previously. His Italian career began with Treviso before his move to Clermont in 2005. He was included in Italy's 2003 World Cup squad before scoring his first Test try against Romania in 2004. A thigh injury threatened to rule him out of Italy's 2007 World Cup bid, but Canale recovered in time to make three appaearances during the tournament. Canale was a key component of the Clermont side which took the 2010 Top 14 title. Since then he has become one of the first names on Nick Mallett's Italy teamsheet - he started all five of their 2011 Six Nations games and scored against Wales in the process - and will travel to the 2011 World Cup.